Beyond Mobility is about prioritizing the needs and aspirations of people and the creation of great places. This is as important, if not more important, than expediting movement. A stronger focus on accessibility and place creates better communities, environments, and economies. Rethinking how projects are planned and designed in cities and suburbs needs to occur at multiple geographic scales, from micro-designs (such as parklets), corridors (such as road-diets), and city-regions (such as an urban growth boundary). It can involve both software (a shift in policy) and hardware (a physical transformation). Moving beyond mobility must also be socially inclusive, a significant challenge in light of the price increases that typically result from creating higher quality urban spaces. 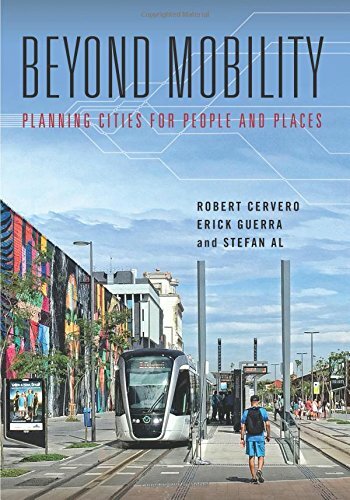 The authors draw on experiences and data from a range of cities and countries around the globe in making the case for moving beyond mobility. Throughout the book, they provide an optimistic outlook about the potential to transform places for the better. Beyond Mobility celebrates the growing demand for a shift in global thinking around place and mobility in creating better communities, environments, and economies.